Fill in your details below and we will let you know within 24 hours if we can get Nothing Personal: Revised Edition to you with haste! In Nothing Personal, you'll lead your crime family to influence the city's most powerful gangsters by bribery, flattery, and occasionally more...direct means. 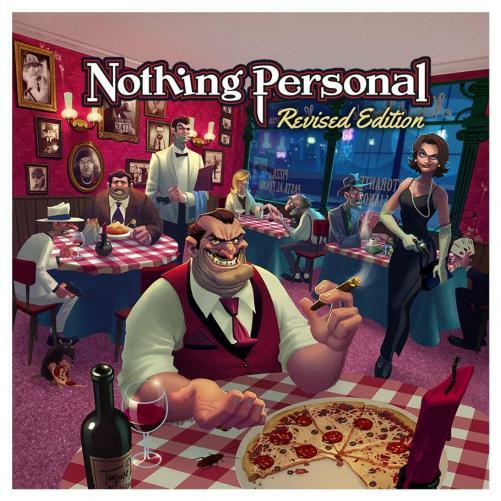 Nothing Personal has become a favorite among gamers since its original release in 2013, and this new revised edition captures all of the backstabbing fun of the original game while introducing new features so every gamer can experience a life of crime. This new Revised Edition of Nothing Personal has been streamlined for a shorter playing time of 60 minutes. This will also lead to more intuitive game play with faster rounds, fewer phases, and less downtime, while maintaining all the negotiation and delicious backstabbing from the original! The rules have been rebuilt to be clear and concise, though are still backwards compatible with the original edition. There are now 2 dice instead of 3, as the 3rd die was eliminated due to redundancy. The player boards have also been removed in favor of reference cards.